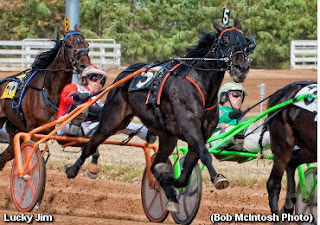 There will be bigger weeks in harness racing this season but the status of the Grand Circuit’s opening weekend, May 6 and May 7, allows the 2011 stakes season to loom boldly. It begins for bettors and horsemen this first weekend in May and the TwinSpires harness department is prepared to bring you more information, inside scoops, on-the-spot changes and value wagering suggestions than anywhere else in the world of wagering. As an addendum to our blog, we offer the wagering public another road—The Hambletonian Trail. An intense, regular following that logs the journeys of soph-colt-and-soph-filly trotters eligible for the August classics—The Hambletonian and Hambletonian Oaks—debuts this week. Be ready, bettors. As the next few months offer stakes and special events that reveal the fields for the trotting classics’ elims and finals, we will keep you abreast with all the betting opportunities across North America. In league with the events’ administrators, the Hambletonian Society, the exclusive “Trail” blog covers every race with every eligible and promises to pick up some major prices along the way, making “getting there” all the fun of Hambletonian day. Also, as last year, we will be live from the Meadowlands for all the Grand Circuit stakes via the blog and Facebook and Twitter. Nowhere else can you get the expert reporting we are offering through TwinSpires and the Hambo society. So get on the shuttle starting this week with Friday’s Lady Suffolk for soph-filly trotters and Saturday’s Dexter Cup for the glamour-boy trotters by visiting the new Trail blog and the Hambo-society page. Free-for-all standardbreds take on the two-turn mile with a prep for the A.J. Cutler Memorial (trotters) and an elim for the Graduate (pacers). The “Cutler” event is an open and looks like a fight between several horses with 2010 divisional honors, including Enough Talk and the mighty mare Buck I St Pat. But all in all, this is a pretty tough field, with some involved that have yet to peak for the new season. Lucky Jim’s new season ensues after a rocky start. He won the Cutler last year. Trainer Julie Miller had “Jim” qualify on May 3 and he destroyed a field with a 1:53 mile. Jim broke badly in his 2011 debut at Chester in April. Julie, whose husband Andy is Jim’s regular pilot, feels Jim has worked through his issues and is ready, even from post 9, to prove he is sound and steady this season. We are watching Celebrity Hercules. He raced earlier this year in the Horse & Groom Series at the Meadowlands and he put in a pretty good effort, finishing second and looking to improve against this tough group. Also, we are keeping an eye on Don’t Know Chip, who has also tipped his mitt earlier this year. In the only elimination for the Graduate, three horses bought in to the final: Foiled Again, Western Shore and Giddy Up Lucky. It appears, however, that the betting public’s eyes are focused on two horses—Won The West and St Elmo Hero. But in this fierce elimination, the one to watch is Lisagain. Many players ignored this guy last year in high company but he has proven to be a dangerous sort in his last couple of starts, finishing second to Hypnotic Blue Chip in the Spring Pacing Championship, only to beat “Hypnotic” the following week. Also, returning after a competitive soph season is We Will See. He will, of course, have had to mature greatly to take on these elders but it is not out of the question to allow him an early shot at being much better than last year. At Chester on Saturday, glamour-boy pacers parade through sires stakes and the Stallion Series Pennsylvania-sired events. Many new faces will be involved in the divisions, making handicapping a wary situation. But these are races to follow, as the division introduces early talent, if not superstars. Also at Chester that day a few familiar faces show up in a $100,000 Open. Five-year-old-and-under horse pacers, some from the “Levy” series and others sporting their early four-year-old careers—One More Laugh, Pangiorno and Clear Vision—go for big bucks. One horse we loved last year though he provided a number of disappointing attempts, is Europan Union. He comes out of the 1 hole and is four wins for a dozen starts so far this season. He may be overlooked, so beware. North of the border Woodbine continues to introduce the new herd of sophomore pacers, launching the Diplomat Series for the colts and the Princess Stakes for fillies. Saturday night, May 7, we endeavor with another ticket for the no-takeout Pick 4 from Race 11 through Race 14. (5) Mighty Fine Hi Ho had only one move but it was a strong venture that far exceeded his 13-1 send off. (6) Arch Nemesis found a way to be third at 9-1 and looks to improve, perhaps at odds like that or better. These two are good prospects considering the crowd will probably hail the horses coming out of posts 2 and 3. (8) Lucky Peterson was third at 6-1, not firing entirely. This could be a more aggressive trip, especially from the outside. As well, (9) Itza Free For All is a beaten favorite that can rebound from last week’s loss and do the job at good odds considering his post. (2) Linnea Blue Chip is a fine single here. Last week’s journey proved futile to a horse that got away from the pack and drew off by 8 lengths. Best of the rest, “Linnea” was sturdy and towered over the others, deserving great expectations for this week against some dull participants. (1) One Hot Tamale tries again as a part of our combo and we have to use him, since that trip was tough enough to excuse. It was amazing he was 4-1 there, where he should have been the dead-on choice. (5) Beach Beach Beach can string together wins and seems to be on another campaign to streak. He won at 3-1 going first over gallantly and drawing off to win. If you want to use all of these, the 56/89/2/15 ticket cost $8 ($1 ticket).